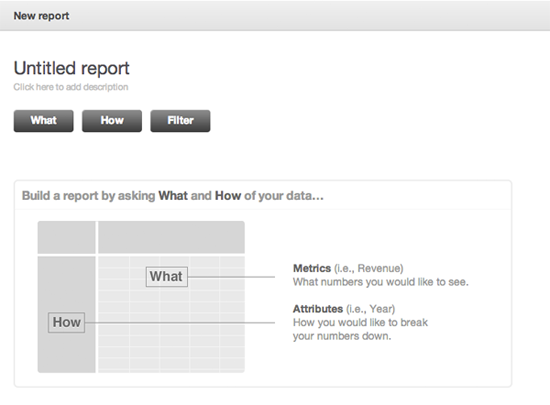 You can create your own custom metrics, reports, and dashboards in Insights. If you have not enabled Insights, see Enabling Insights for yourself. If you are an Enterprise agent in a custom role, you might not have access, depending on how your admin set up your custom role. For more resources see Insights resources. You can add dashboards and tabs to your Insights project. Tip: Currently you cannot customize the order of the dashboards in the drop-down list in Insights. The list appears in alphabetical order. At Zendesk, we add a number to some of our dashboard names to force them to appear in a certain order. For example, "1. Executive Summary" and "2. Weekly Performance." Click GoodData in the upper-right corner. 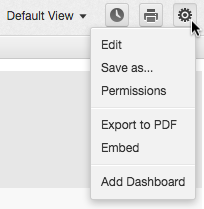 Click the Edit, Embed, or Export gear icon in the upper-right, then select Add dashboard. Click the Edit icon in the upper-right of your dashboard. Click the Plus (+) at the end of the dashboard tabs. In the Add Tab dialog box, enter a Tab name, then click Save. 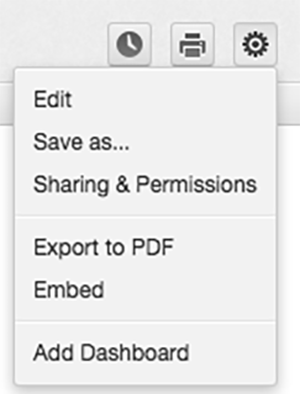 Click the Edit dashboard icon in the upper-right corner. Click the arrow beside the tab you want to modify, then select the appropriate action. You can add a new report to an existing tab in a dashboard. 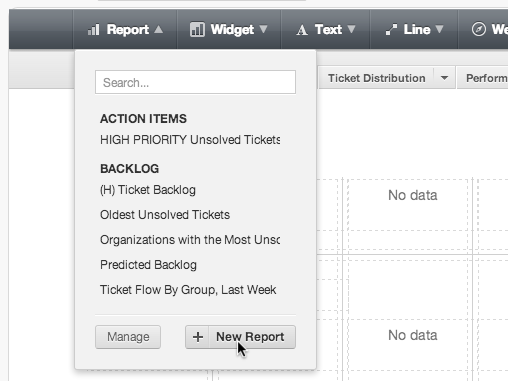 For information on creating new reports, see Building custom reports in Insights. Click the Edit dashboard icon in the upper-right of your dashboard. Click Reports, then click New report. Configure your new report, then click Done when you're finished. For information about creating metrics How to create a custom metric on the GoodData website. For information about reporting on custom fields, see Reporting on custom fields in Insights. When your report appears, click Create in the upper-right. 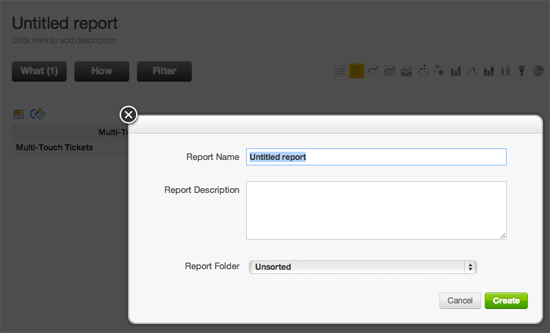 In the dialog box, enter a report name and description and select a folder, then click Create. Attribute: Filter by values of a selected attribute. For example, you can only show results for Incident tickets by adding the Ticket Type filter and selecting the Incident value from the drop-down list. For more information, see Filter for attributes on GoodData's site. Date: Filter by a selected date or date range. For more information, see Filter for dates on GoodData's site. Group: Filter results using multiple filters simultaneously. The filters you select will be applied at the same time. For more information, see Set Up a Filter Group. On your dashboard, click the Settings icon ( ). In the Settings drop-down menu, select Edit. On the top toolbar select Filter. Select a filter type from the drop-down list. Select attributes, dates, or filters to group together. When you are finished editing your dashboard, click Save. When you first create a dashboard or report, it is automatically hidden from everyone. However, through changing Visibility permissions, you can decide who has access to your dashboard and who doesn't. After you create your dashboard, you can make it visible to everyone or only specific users. Your dashboard will not be visible until you change Visibility permissions. Note: You cannot set different permissions for each tab. For more information, see Can I provide users access to specific tabs within a restricted Insights dashboard? in our Support tech notes. In Sharing & Permissions you can either select Everyone can access to make the dashboard visible to everyone, or add specific users to the dashboard. Clicking the X next to specific users names. Selecting Specific users can access option. 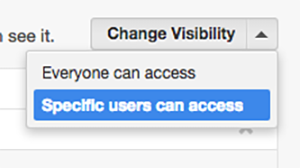 Select the Specific users can access option in the Change Visibility drop-down menu. Click the Add Users button at the bottom of the box. You can search for a specific name, or scroll. I created a dropdown ticket field, with a few values, like the default field "type". I need to create a report about how many tickets are solved on this values. For example, how many tickets are solved on "incident", how many on "question"... but with my own values. How I can do this? I need help. Once solved tickets exist with values in that field, that data will automatically sync over to Insights and you can create a report with it. You can find more detailed information on how to do this here: Reporting on custom fields in Insights (Professional and Enterprise). I have created a dashboard I want to share with everyone in a Microsoft group but when I embed the link supplied, it asks for a Zendesk Analytics sign-in. My intention is to share the dashboard in that group without them having to do this login. Can you help please? I get around this by sending as a pdf via email (I'm on Enterprise, not sure if that makes a difference) with pdf to the interested parties. Not really but thanks anyways. We got really excited about the ability to embed dashboards into a webpage, but it's absolutely pointless if it can only be accessed behind a login for agents. It would be a great tool to share and "toot our own horns" so that our actual stats are visible to our end users/coworkers/non-it superiors. Why the login? Folks get enough emails as it is. Email reports is not ideal. I am creating a dashboard(s) for a multi-brand instance. I would like each brand to have the same dashboard. I have been creating the same report twice and then adding the relevant reports to the relevant dashboards. Is it possible for me to create one dashboad and then use a filter by brand? If so, when I choose "Ticket Brand" as the filter option, I see two options but they are numbers, not the names of the brands. Any suggestions? I would suggest that you want to avoid repeating yourself with multiple dashboards and the filter option is the best way to go. This should be possible. It sounds like you are looking at the internal number for the brand. When you apply the filter, ensure that the label is is set to 'Ticket Brand Name'. Okay, so can I create a dashboard with multiple tabs, and have a filter affect one tab and none of the others on the dashboard? I'm trying to create a multi-tab dashboard with one unfiltered, high level tab, one drop-down-filterable drill down tab, and a series of tabs with static filters on them (specifically, by Org Name). At present, every time I try to add a filter, it filters every tab that has that same filter on it the same way. So, if I put an Org Name drop-down on my second tab, any org names I add/remove from that filter effect all of my other tabs with that same drop-down filter on them. But leaving that drop-down off, leaves the tab unfiltered. Is there a way to filter three tabs to one different org name each? I am the account holder and admin but I do not have the settings option that allows me to customize reporting on the dashboard. We do have the Enterprise Suite. How do I turn on that ability? Hoping this is a simple question and please forgive my ignorance if it is. How does one create the fancy rounded boxes that are shown on the Overview? All I can seem to find is a horizontal line or vertical line. Those don't exactly line up when trying to segment reports from an aesthetics perspective. It is not at all obvious how to make fancy rounded boxes and other fancy reporting features. It takes a little more effort but you can see details here in GoodData's support site. You cannot customise the dashboards that come with Zendesk support. However, you can create your own dashboards using the Insight tool. This takes a little time to learn, so it is best to start with the resources provided by Zendesk here. How long does it take for changes on tickets to filter to reporting? I feel like once the ticket has been saved, the report should be updated to any changes that have happened. If you're on the Support Professional plan your data will sync over once every 24 hours. If you're on the Enterprise plan your data will sync every hour. More information in the following article: How frequently does my Support data sync to my Insights project? Thanks for the update Timothy. While the changes won't show up immediately, your data will sync once every hour. I am not able to see how to remove or modify a dashboard filter. I can see how to activate it and deactivate it for each widget but I can't see how to completely remove it or modify it. I only want to modify it if possible. You can only remove or modify dashboard filters that you have created. The Insights dashboards provided by Zendesk cannot be removed or modified other than making new selections. To edit a filter, first edit the dashboard. Click the settings cog from the top right hand corner of the dashboard. You can then click on your filter, then select the settings cog there to edit the filter or click the trash can to delete the filter.